(Nanowerk News) Physicists at the University of Basel have developed a new cooling technique for mechanical quantum systems. Using an ultracold atomic gas, the vibrations of a membrane were cooled down to less than 1 degree above absolute zero. This technique may enable novel studies of quantum physics and precision measurement devices, as the researchers report in the journal Nature Nanotechnology ("Sympathetic cooling of a membrane oscillator in a hybrid mechanical-atomic system"). Ultracold atomic gases are among the coldest objects in existence. Laser beams can be used to trap atoms inside a vacuum chamber and slow down their motion to a crawl, reaching temperatures of less than 1 millionth of a degree above absolute zero – the temperature at which all motion stops. At such low temperatures, atoms obey the laws of quantum physics: they move around like small wave packets and can be in a superposition of being in several places at once. These features are harnessed in technologies such as atomic clocks and other precision measurement devices. A cloud of ultracold atoms (red) is used to cool the mechanical vibrations of a millimeter-sized membrane (brown, in black frame). 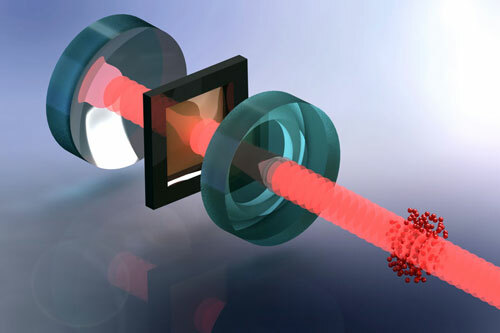 The mechanical interaction between atoms and membrane is generated by a laser beam and an optical resonator (blue mirror). (Image: Tobias Kampschulte, University of Basel). Can these ultracold gases also be used as refrigerants, to cool other objects to very low temperatures? This would open up many possibilities for the investigation of quantum physics in new and potentially larger systems. The problem is that the atoms are microscopically small and even the largest clouds produced thus far, which consist of several billion ultracold atoms, still contain far fewer particles than something as small as a grain of sand. As a result, the cooling power of the atoms is limited. A team of University of Basel researchers led by Professor Philipp Treutlein has now succeeded in using ultracold atoms to cool the vibrations of a millimeter-sized membrane. The membrane, a silicon nitride film of 50 nm thickness, oscillates up and down like a small square drumhead. Such mechanical oscillators are never fully at rest but show thermal vibrations that depend on their temperature. Although the membrane contains about a billion times more particles than the atomic cloud, a strong cooling effect was observed, which cooled the membrane vibrations to less than 1 degree above absolute zero. “The trick here is to concentrate the entire cooling power of the atoms on the desired vibrational mode of the membrane,” explains Dr. Andreas Jöckel, a member of the project team. The interaction between atoms and membrane is generated by a laser beam. As the physicist explains: “The laser light exerts forces on the membrane and atoms. Vibration of the membrane changes the light force on the atoms and vice versa.” The laser transmits the cooling effect over distances of several meters, so the atomic cloud does not have to be in direct contact with the membrane. The coupling is amplified by an optical resonator consisting of two mirrors, between which the membrane is sandwiched. Systems that use light to couple ultracold atoms and mechanical oscillators have already been proposed theoretically. The experiment at the University of Basel is the first worldwide to realize such a system and use it to cool the oscillator. Further technical improvements should make it possible to cool the membrane vibrations to the quantum-mechanical ground state. For the researchers, cooling the membrane with the atoms is only the first step: “The well-controlled quantum nature of the atoms combined with the light-induced interaction is opening up new possibilities for quantum control of the membrane,” says Treutlein. This may enable fundamental quantum physics experiments with a relatively macroscopic mechanical system, visible to the naked eye. It may also be possible to generate what are known as entangled states between atoms and membrane. These would allow measurement of membrane vibrations with unprecedented precision, which in turn could enable the development of new kinds of sensors for small forces and masses.